Pop Goes the Easel is a fast-paced, very funny Three Stooges short film. The film, released in 1935 during the midst of the Great Depression, reflects the hardship in finding a job by having the inept Stooges trying to find work, and failing in various funny ways. The movie follows each of the trio as each tries to get a job, and fails — one of my favorite moments occurs when they reunite, and Moe asks Curly to spell “chrysanthemum,” since Moe has just failed to get a job based on his inability to spell it — which Curly proceeds to spell correctly, making Moe angrier! Moe then decides that they should each grab a broom from in front of a storekeeper’s shop, and start sweeping the sidewalk in hopes of impressing the storekeeper and getting a job. 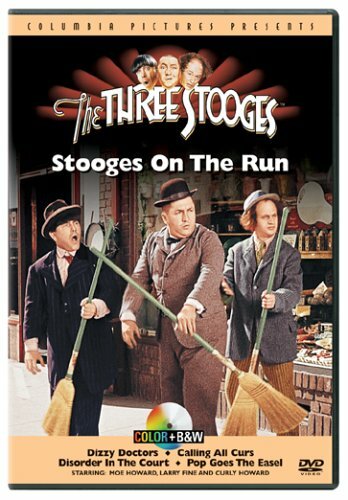 Instead, the storekeeper thinks that they’re trying to steal his brooms, and calls for the police, leading into a chase of the Three Stooges that leads into the second half of the short film. The Stooges duck into a nearby building for cover, where they walk into an art school — and to throw the pursuing detective off their trail, dress the part and start acting like art students. The mayhem builds quickly, ending with a large fight with the sculptor’s clay, not unlike the pie fights that they became famous for. The short ends when everyone realizes that the Three Stooges were the instigators of the chaos, and the other students start beating them up. Pop Goes the Easel is a fine example of early Three Stooges mayhem, and is available on DVD as part of The Three Stooges Collection volume 1 — a colorized version is available on DVD as part of The Three Stooges: Stooges on the Run. Larry (Larry Fine): [after Moe has whistled for he and Curly to come to his side] What’s the matter? Moe (Moe Howard): How do you spell “chrysanthemum”? Moe (Moe Howard): Oh, ignorant, eh? Moe (Moe Howard): How do you spell it? Curly (Curly Howard): [very quickly] C-h-r-y-s-a-n-t-h-e-m-u-m.
Moe (Moe Howard): [pause] Why weren’t you here a minute ago? Curly (Curly Howard): [looking up, after Moe has instructed an art student to pose as if she was looking at a group of grouse flying overhead] I don’t see any grouse. Moe (Moe Howard): [kicks Curley] See any now? Moe (Moe Howard): [kicks Curley again] See any now? Curly (Curly Howard): Ah, look at the grouse! Larry (Larry Fine): Yes sir! Man: Tell me…what would you do if you held the Queen alone? Larry (Larry Fine): When the king’s expected home! Larry (Larry Fine): Oh, an art school! Moe (Moe Howard): You know, my old man used to draw. Curly (Curly Howard): Sure, he drew twenty years with one stroke of the pen! Detective: Oh, pardon me, youâre French. Moe (Moe Howard): [with Irish accent] By golly, thatâs what I am. Moe (Moe Howard): What is it? Curly (Curly Howard): Sitting Bull. Moe (Moe Howard): I donât see his face. Curly (Curly Howard): Heâs got his back turned. The title of the film Pop Goes the Easel is a pun on the nursery rhyme “Pop Goes the Weasel,” which is used for the one and only time as the opening theme. The film also ends with the tune, as with the ending of Punch Drunks. The two girls playing hopscotch on the sidewalk are Moe Howard’s daughter, Joan and Larry Fine’s daughter, Phyllis. This is the first of several Stooge shorts in which Moe holds out his hand to Curly and asks him to “pick out two” fingers. Curly does, and Moe pokes him in the eyes with them. This would be a recurring joke. This short contains a very rare scene in which Moe delivers a slap in the face to several people at once. At the end of the clay fight scene, Moe stops everyone and asks “who started this? !” Larry yells “YOU did!”, to which Moe angrily replies “oh YEAH? !” and, with right hand extended, spins in a counter-clockwise motion, slapping everyone around him. This short is the first to contain a clay throwing fight, a precursor to the classic pie fights which would become a staple of the Stooge films. The first genuine pie fight would appear the following year in Slippery Silks. This is the first Stooge short in which Moe holds out his fist to Curly and says, “See that?” When Curly replies, “Yeah,” he smacks the fist dismissively, in which it swings in a circle behind Moe’s body, over his head, and bops Curly on the head with it. This is the first short in which Curly dresses in drag. Curly would somehow wind up in drag in several later Stooge shorts, such as Uncivil Warriors, Movie Maniacs, Matri-Phony, Micro-Phonies and Uncivil War Birds.